My love for North Carolina goes deep. We have the mountains on the West and the coast on the East, with abundance in between. What more could anyone want? 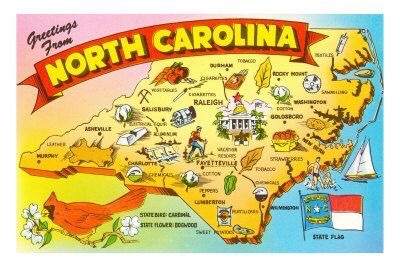 Nicknamed the Tar Heel State, NC’s history dates back to the original 13 colonies. It became a state in November 1789 and today, 227 years later, North Carolina is still thriving and has something for everyone. NC is surrounded by numerous mountains, including the Appalachian and Smokey Mountain ranges. This area can be divided up into three different parts: the Foothills, the High Country, and the Smokey Mountains and Cherokee. Within the Foothills, the city of Asheville is a favorite among many. Visitors can tour the famous Biltmore House and Estates. End the day in the city’s lively downtown with eclectic food and shopping. Looking at the Foothills, other hot spots travelers love are the Blue Ridge Parkway and Pisgah National Forest. The High Country includes the towns Boone and Blowing Rock. Go back in time to the Wild West at Tweetsie Railroad or take a walk on the mile high bridge at Grandfather Mountain. During the winter, Beech and Appalachian Mountains are popular among skiers and fans of winter sports. As for the Smokey Mountains, Cherokee Indians often referred to them as “the land of the blue mist.” Some areas of interest here are the Great Smokey Mountains National Park and Bryson City. Heading inward, the next part of the state is the Piedmont region, home to Charlotte, the Piedmont Triad, and the Triangle. Located near the border between North and South Carolina, Charlotte lives up to its advertising motto “Charlotte’s Got A Lot.” Visitors can enjoy the thrill rides at the theme park, Carowinds , discover news things at The Discovery Place, or fill their need for speed at the NASCAR Hall of Fame, and Charlotte Motor Speedway. In addition, Concord Mills and the American Girl store are ideal places to shop in the city. Greensboro, Winston-Salem, and High Point create the Piedmont Triad. Animal lovers will dig the Greensboro Science Center and the North Carolina Zoo in nearby Asheboro. In Winston-Salem, see where the Moravian town of Salem started by touring Old Salem, the historical replica of the town. The neighboring city of High Point is known as the furniture capital of the world, full of shops and museums. While there, be sure to take a picture with the World’s Largest Chest of Drawers. Not too far away from the area is the Yadkin Valley, where many wineries are located. The Triangle consists of our state’s capital Raleigh, as well as, the main cities of Durham and Cary. Visitors can explore Raleigh’s Museum of Art and Museum of History, while sports fan can catch a game of the Carolina Hurricanes or the Durham Bulls in their stadiums. Over 300 miles of beaches, tons of lighthouses, and a chance to see wild horses on the beach make up the perfect place to relax on the coast. In addition, history lovers can visit Revolutionary and Civil War sites. Two favorite spots for travelers: the Outer Banks and Wilmington. The Outer Banks and Currituck offer new adventures. See where the Wright brothers first took flight and learn about their journey at the Wright Brothers National Memorial in Kill Devil Hills. The Cape Hatteras lighthouse, finding the wild horses in Corolla, or catching a show at the Lost Colony outdoor theater in Manteo are foolproof ways to spend the day. Lastly, Wilmington, nicknamed Hollywood East, attracts people near and far. Fans can tour various filming locations of movies and TV shows, including Iron Man 3 and One Tree Hill. Aside from the film scene, Wilmington’s Historic District shouldn’t be missed, along with the NC Aquarium and Fort Fisher. A unique experience for all ages is stepping aboard the USS North Carolina Battleship, where you learn about the battleship’s history and more. Whether you are new to the area or lived here your whole life, the Tar Heel state offers plenty of adventures, fun times, and great memories. This entry was posted in Uncategorized and tagged country, country music, forsyth, forsyth family, hallmark channel home and family, huffington post, magazine, north carolina, picture, pinterest, quote, samantha brown, state, today show, today show nbc, travel, travel channel, united states, visit nc, visit north carolina by METAYLOR. Bookmark the permalink.